Ideal for service departments, our Cesa forms can be used as invoices, job cards, or warranty claims forms. The forms are 4 part and colour coded, allowing for several copies to be distributed. The 4th part is a 150gsm card, ideal for upright or file storage. Each Cesa form is consecutively numbered so each job has its own number. There are 2 detachable tags at the bottom of the form, to attach to goods or use as an internal call log. There is also a detachable customer claim tag. Each form comes with 2 hole punches for easy filing. 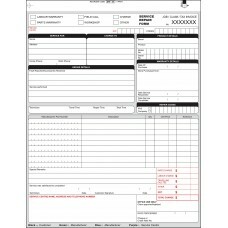 We can even pre-print your Cesa forms with your company details. Service repair forms are a cost effective system to run your service department. They can be used to document each job from the time you log in the service call. For field calls, the service repair forms can be prepared in advance for the technician with customer and fault details. For workshop jobs there are detachable tags to attach to goods and a detachable customer claim tag. These tags are all numbered for easy job identification.